"Performances of medieval music inherently involve reconstruction, and questions of style must usually be answered with an educated guess. Machaut's Mass is perhaps the greatest monument of 14th-century music, scrupulously preserved by the composer in manuscripts, yet it too offers many possibilities to interpreters. This recording by the Ensemble Gilles Binchois takes a different route through the music than most, and it's an alternative that deserves consideration. Most groups, such as the Hilliard Ensemble and Ensemble Organum, emphasize the aspects of the Mass that make it seem most radical today: the dissonant harmony and the jaggedly interlocking rhythms known as 'hockets'. 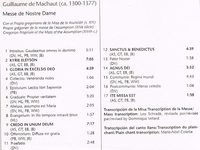 By contrast, this may be the most smooth and euphonious performance the Mass has received since its rediscovery, making for a far more serene and devotional experience than usual. An imposing wall of sound is created by the four soloists, amplified by a resonant cathedral acoustic; the incomparably sweet voice singing the top part is none other than countertenor Andreas Scholl, who was just beginning his career when this recording was made in 1990. 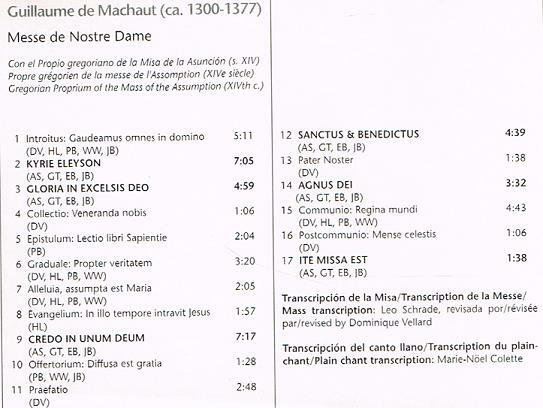 A second group of singers performs the liturgically appropriate Gregorian chants between the sections composed by Machaut, adding to the reverent atmosphere. 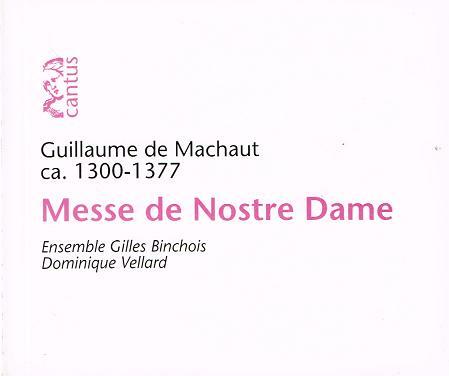 It's impossible to say for sure whether the Ensemble Gilles Binchois is on a historically authentic path here, but like any masterpiece, Machaut's Mass is only enriched by diverse and carefully considered approaches such as this."